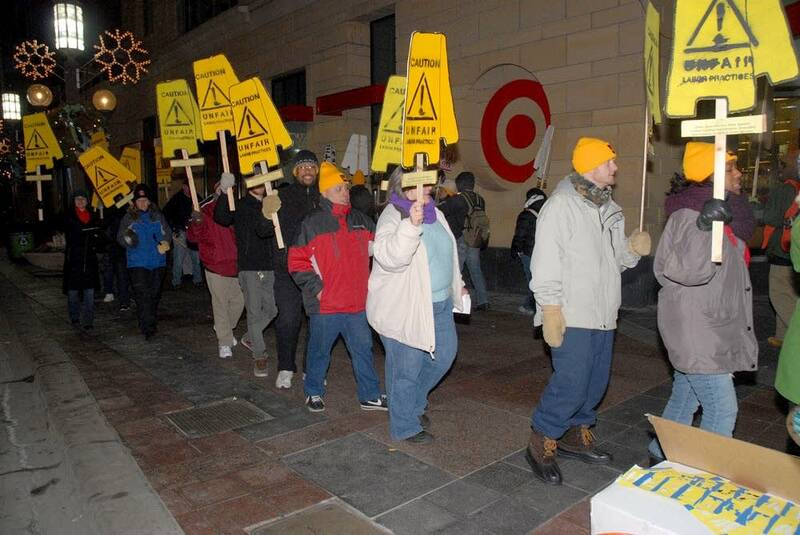 Dozens of people walked a picket line in front of the Target store on the Nicollet Mall Tuesday morning, in what organizers are calling an unfair labor practices strike against firms that clean big box retails stores. Among the companies: Carlson Building Maintenance and Diversified and Eurest Services, according to Veronica Mendea, an organizer with an organization called Center of Workers United in Struggle. Its members clean Target stores around the Twin Cities, she said. "What's happened is, over the last couple of years, workers have been organizing for better wages and working conditions, because over the last 10 years, wages have gone down and workload has gone up," she said. While thousands union office cleaners have reached a tentative contract agreement, store cleaners haven't been able to unionize, she added. A spokeswoman for one of the cleaning firms, Diversified Maintenance, Andrea Kiehl, said customers in the stores Diversified cleans shouldn't notice the difference, and that few cleaners left their jobs. "Diversified clients are not feeling the one-day strike," Kiehl said. "We have had very few call-outs this morning; we had three call-outs that we believe are related to the strike. And all stores are being cleaned as usual." Mendez said the strike involves about 10 stores in the Twin Cities area today. A rally was planned for later Tuesday morning.